This species has distinctive spear-head-shaped leaves, which are narrower in proportion to length than those of most other sinningia species. The flowers have a galea. It has a normal tuber, but under my conditions, it does not go dormant. The species thrives on abundant water. This species has leaves which are rather unusual for a sinningia. They are long and narrow, more reminiscent in shape of Seemannia sylvatica (although the leaves are wider when there is abundant water). The dark foliage is particularly attractive. Sinningia glazioviana is one of the "Galea Group", a cluster of closely related species which all have flowers with an overhanging upper lip, formed by the two uppermost corolla lobes. A personal note from Frances Batcheller to the then AGGS Registrar, Jimmy Dates, in 1988, described plants grown from seed collected by Mauro Peixoto. "Plant came from Serra de Bocaina, Brazil, but was found growing on the rocks that emerge from a very cool water river. The tubers were just above the water level, being always very wet and completely submerged when the river is high... It is a compact grower and does not have a rest period." I have not tried growing it completely submerged. This alien creature is the flower of S. glazioviana with the corolla and most of the calyx removed, to show the nectaries. It's smiling, isn't that nice? 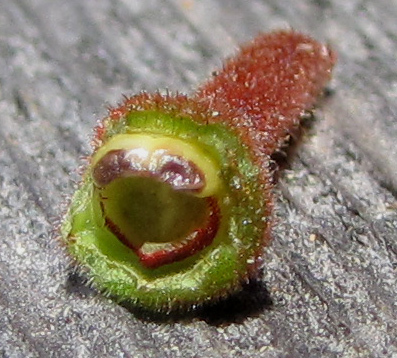 The outer green ring is the base of the calyx. At the top, just inside the ring, is a pale yellow area with side-by-side purplish blotches. These are the nectaries, connected by the yellow area. Habit Stems more or less upright, with flowers in leaf axils. Season Unpredictable in cultivation. Early summer in habitat. 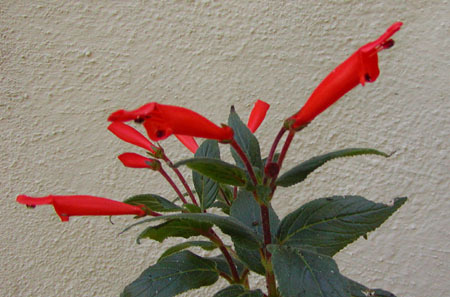 Flower Red, tubular, with galea, about 5 cm [2 inches] long. Recommended? Yes. Nice foliage, nice flowers, easy to grow. Taxonomic group The galea group of the Dircaea clade. Fritsch, 1906 (as Corytholoma glaziovianum), transferred to Sinningia by Chautems, 1990. At a guess, the species is named after Auguste François Marie Glaziou (1828-1906), a French landscape designer and botanist who was responsible for several parks in Brazil.